This is the First World War Diary of my grandfather, Robert Lindsay Mackay (1896-1981), OBE, MC, MB, CHB, MD, DPH, giving an account of his day-to-day life with the 11th Battalion of the Argyll and Sutherland Highlanders from 1915 until the end of the war. About this War Diary of mine! My Dear Alan, Sheila, Mary and Murray. I finished, two days ago, what I intended to be positively the last contribution to my side of the family story, quite certain that apart from minor corrections here and there nothing more could be added. Then I looked around for something to do. It occurred to me to look at my diary of War I which had been in my desk or on my shelves, almost unopened and unread, for over fifty years! Indeed, only three persons had read it, namely John Buchan (Lord Tweedsmuir) who had asked for a perusal of personal war diaries for his History of the 15th. 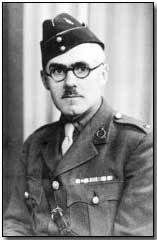 Scottish Division, my friend the late Dr. D.T. McAinsh, M.C., and the third, strange to say, my next-door neighbour, Chatwin. About a month ago, Chatwin had been talking about the Somme Offensive of which he was a survivor when I mentioned I still had my Somme Diary, and he asked for the loan of it to compare with his experience in that prolonged battle. I am not quite clear why I wrote this diary, day by day, a scrappy record of a scrappy period. I had no literary or military ambitions. My parents did not read it. Perhaps it was to provide a kind of continuous alibi, to remind me where I had been, perhaps an interesting memorial if I failed to return. Like cakes off a hot griddle, it was written as events occurred, or immediately thereafter, in four little brown leather-covered notebooks, and when the war ended these were in no state to last long for they were soiled and grubby, and, where written in pencil, the writing was fading. So, in 1919, I copied their contents, straight off, without editing, into two larger note-books, and destroyed the four little ones. You, Mary, arrived last night from Hull, with your two children, and the talk drifted on to the Highlands and to my family history. Urged on by you, and by Judith, whose family roots in England go back a century or two further than mine in Scotland, urged too by your Mother, I'll type out a copy for each of you, for your deed-box, and for futurity! "The Moving Finger writes; and, having writ, Moves on; not all thy Piety nor Wit Shall lure it back to cancel half a line, Nor all thy tears wash out a Word of it".